There is little collegiality in the serious pursuit of science. However perplexing, even for the smartest physicists, quantum mechanics is having a moment, with five new books taking different approaches but ultimately grappling with the same question: Can we ever make sense of quantum mechanics? Let’s start with a Physics 101 refresher. In ­classical physics — that of Isaac Newton — causes and effects are linked in a straightforward way. In Newton’s universe, if you knew what had happened, you could calculate what was going to happen. In principle, if you knew the positions and speeds of all the particles that make up the universe, you could work out the universe’s future evolution through to the end of time. By the end of the nineteenth century, however, it was obvious that classical physics couldn’t explain everything. It was already clear that light, which behaves sometimes like a wave and sometimes like a stream of particles, didn’t quite fit the existing framework, but things quickly got worse. In particular, the goings-­on inside the atom seemed to defy a Newtonian explanation. Max Planck was the first to suggest the way forward: at the dawn of the twentieth century, he proposed that energy must come in discrete little bundles, or “quanta.” Einstein played a crucial role, too. He figured out how quanta of light, which we now call photons, interact with matter (for which he was eventually awarded a Nobel Prize). Niels Bohr used quantum theory to explain the structure of the atom; Louis de Broglie proposed that solid matter can sometimes behave like waves, just like photons of light do. These may seem like disparate discoveries, but all of these scientists were poking at the same elephant, and by the end of the 1920s, following the work of Schrödinger and Werner Heisenberg, the theory was essentially complete. We now had a new kind of mechanics — quantum mechanics — that explained the workings of matter and energy at a deeper level than the mechanics of Newton. Classical physics was just fine for planes, trains, and automobiles, but only quantum mechanics succeeded at the micro level. Quantum mechanics is very different from Newtonian mechanics. For starters, in the quantum world, particles don’t have specific positions and locations — at least, not the way they did for Newton. Let’s say we want to know if an electron is located to the left of a proton or to the right of it, at some particular moment. The theory only gives us the probability that we’ll find it on the one side or the other. Before the measurement is made, however, it’s simply not meaningful to speak of the electron’s location. More generally, a quantum “state” can’t be pinned down prior to measurement: a physical system can be said to be in many states at once, what physicists call “superposition.” The most famous example of this is Schrödinger’s unfortunate cat, which, according to quantum mechanics, is alive and dead at the same time. The mathematics behind quantum mechanics is well understood. The math describes a kind of wave. It’s not a physical wave, like a water wave or a sound wave, but rather an abstract mathematical entity, one that goes by the name “wave function.” It is extraordinarily useful: physicists can use the wave function to work out the probability of getting this or that particular result when a measurement is eventually made. Is the electron more likely to be found over here or over there? The wave function spells out those probabilities, and when we actually make a measurement, it is said to “collapse.” Before the measurement, the wave function covers a multitude of possible realities; after, it collapses down to just a single description. By now you may have a sense of why so many thinkers have found quantum theory troubling. Why does it place such significance on the act of observation? Does this, in turn, mean there’s something special about the humans who make the observations? (What if the observation was made by an animal or a robot or . . . ?) Why don’t we see quantum fuzziness in the everyday world? And what actually happens when the wave function collapses? Physics is a secular pursuit, but, secular or not, it is physics, more than any other science, that appears to offer a glimpse of the eternal. If Copenhagen is too magical for our tastes, how else might we interpret the theory? If you’re looking for a version of quantum mechanics that “keeps it real,” so to speak, you might start with an idea put forward by Louis de Broglie in the 1920s and further developed by David Bohm in the 1950s. It goes by the name pilot wave theory, or de Broglie–Bohm theory. And Smolin, who lives in Toronto and has a faculty position at the Perimeter Institute for Theoretical Physics in Waterloo, Ontario, believes it’s been given short shrift. The main appeal of pilot wave theory is that it does away with Copenhagen’s inherent fuzziness. In the pilot wave picture, each particle has an actual, definite location, even when it’s not being observed. (There’s still a wave function, which guides the particle along its trajectory. The probabilities haven’t gone away, but now they merely reflect our ignorance of exactly where things are and how they’re moving.) Like Ball, Smolin sees Copenhagen’s supremacy as largely a matter of historical accident. Had pilot wave theory been taught all these years instead of being virtually ignored, perhaps it, rather than Copenhagen, would be at the top of the hill. Mind you, it still has its share of weirdness. As with Copenhagen, it allows for two or more particles to be governed by a single wave function. When this happens, they’re said to be “entangled.” When we measure the properties of one member of an entangled pair, we instantly gain information about the other member, even if it’s far away. Einstein dismissed such interaction as “spooky action at a distance,” but many experiments have confirmed that entanglement is a real phenomenon. Have no fear, though: there are plenty of alternatives beyond Copenhagen and pilot wave theory. 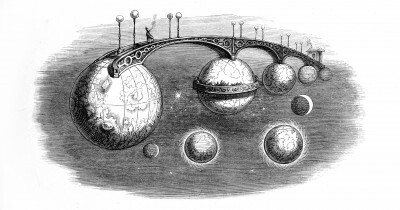 Of these, the most mind-­boggling is the so-­called Many Worlds Interpretation, or MWI. It asks us to take the wave function at face value. If the ­quantum wave function describes the electron as being here and also being there, let’s accept that it is in both places. In the Many Worlds view, which goes back to the work of Hugh Everett III in the 1950s, wave functions don’t collapse — ever. Every time a quantum system can evolve in one way or another, it does both. Everything that can happen does happen — but in separate universes. It may sound like science fiction — indeed, this is Smolin’s assessment — but MWI has some big-name supporters, including Max Tegmark, David Deutsch, and Sean Carroll. While all of these books overlap in their content, there are some telling differences. Ball, for example, has little patience for MWI and its claim that we live in just one universe of a possibly infinite multiverse. Consider the notion of the self. What can it mean, he wonders, to say that each of us exists in billions of copies, scattered across billions of realities? MWI, Ball says, “denies the existence of facts at all.” It serves to “undermine a scientific description of the world far more seriously than do any of its rivals.” (There are technical problems, too, that concern how the theory treats probabilities.) Becker, in contrast, gives us something like a defence of MWI, or at least he’s prepared to do battle with some of the more popular anti-­multiverse arguments. As a science journalist, I greatly enjoy both Ball and Becker. I advise casual readers to turn to Ball if you want to know how and why we’re attempting to build quantum computers. If you want to know what happened when Planck met Hitler, go with Becker. When one reads about the frontiers of physics, one might be left with the impression that physicists do little more than lean back in their chairs and try to conjure up the most bizarre theories possible. Since the time of Galileo, however, physics has been intimately tied to experiment. It remains so today. (At least, theorists understand that to be taken seriously, their ideas have to be amenable to eventual testing.) The point is that quantum mechanics works. Depending on how you measure it, its predictions have been confirmed experimentally to eleven or perhaps even fourteen decimal places, and it’s given us everything from lasers to semiconductors. The experimental side of physics is front and centre in Anil Ananthaswamy’s Through Two Doors at Once: The Elegant Experiment That Captures the Enigma of Our Quantum Reality. Like Ball and Becker, Ananthaswamy, an award-­winning science writer who divides his time between Berkeley and Bangladore, tells the history of how we’ve come to understand the quantum world. He takes the most journalistic approach, sitting down with today’s leading quantum physicists to give readers a front-row seat at the battle of ideas. In particular, Ananthaswamy focuses on experiments that have guided our theoretical musings (and his title comes from the “granddaddy” of all quantum experiments, the famous double-­slit apparatus that Richard Feynman once argued “has in it the heart of quantum mechanics”). He describes experiments that continue to challenge our understanding of the quantum world, including some fascinating work being carried out by Aephraim Steinberg and his colleagues at the University of Toronto, that appears to bolster the pilot wave picture. Jim Baggott, a science writer based in Reading, England, gives us a book that is heftier yet has a narrower focus. In Quantum Space: Loop Quantum Gravity and the Search for the Structure of Space, Time, and the Universe, he details the quest to go beyond quantum theory to something more complete — ideally, something that might unify quantum mechanics and Einstein’s theory of gravity, known as general relativity. The most famous candidate for a “theory of everything” is string theory, but Baggott focuses on its lesser-­known rival, loop quantum gravity. And, of course, there’s Smolin’s new book, Einstein’s Unfinished Revolution: The Search for What Lies beyond the Quantum. At first, its story parallels those of Ball and Becker, as Smolin lays out the history of quantum mechanics, its puzzles and paradoxes, and some of the proposed solutions (and his aforementioned affinity for pilot wave theory). While the other authors explain how we got into our current quantum quagmire, Smolin is eager to dig us out. Quantum mechanics is also just too weird not to leave its mark on pop culture. Many know about Schrödinger’s cat from the TV show The Big Bang Theory, and a couple of Marvel mega-­films have taken us into the “quantum realm.” But I suspect these are all reflections of our interest in the quantum world, not the cause of it. Perhaps the real driver of our quantophilia is simply that we yearn to know what sort of universe we live in. Back at the dawn of modern physics, thinkers like Newton pondered the machinery of the universe and saw God’s handiwork. Today, physics is a secular pursuit, but, secular or not, it is physics, more than any other science, that appears to offer a glimpse of the eternal. When Stephen Hawking wrote about knowing “the mind of God,” metaphorical as it was, his line resonated with readers (in numbers that surprised even him). What is space? What is time? What is reality? If quantum mechanics is a crucial part of the answer, we want to know at least something about it. If someone we trust believes a deeper theory lurks below the quantum, we want to hear about that, too. These books help us do that.